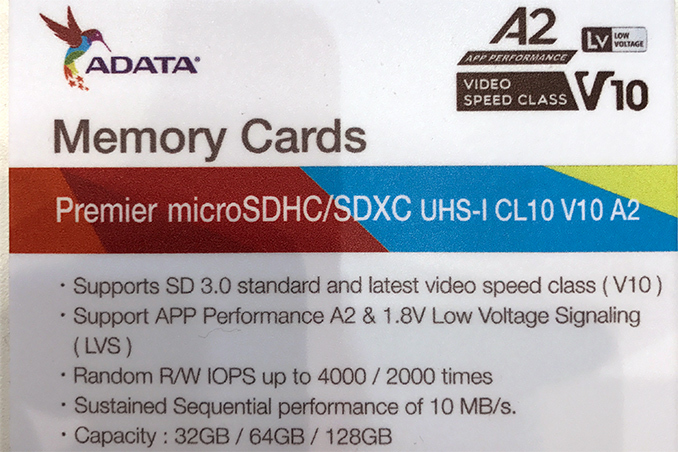 ADATA displayed its first microSD card that is compliant with the App Performance 2 (A2) specification introduced earlier this year at Computex. The company is mulling to release the card later this year, but this depends on availability of hosts that support features mandated by the A2. 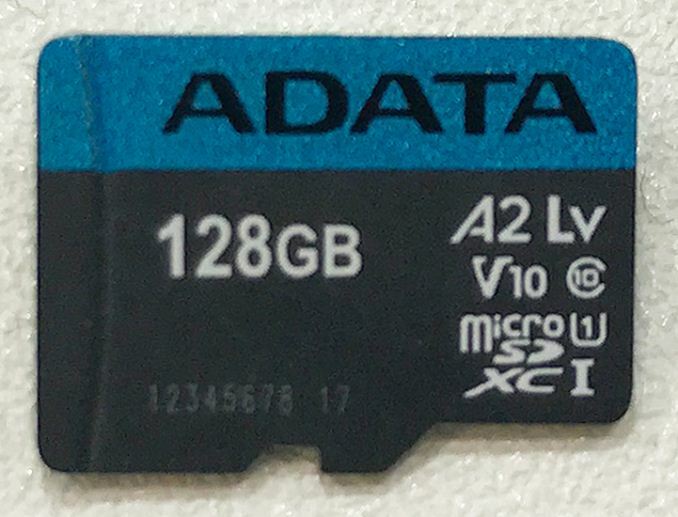 ADATA’s lineup of A2-compliant Premier microSD cards will include 32 GB, 64 GB, and 128 GB models. The new cards will use the UHS-I bus with up to 104 MB/s sequential read/write speed, so do not expect extreme performance numbers from such devices. In accordance with the A2 requirements, the cards provide a random performance of at least 2000 write IOPS, at least 4000 read IOPS as well as sustained sequential read/write speed at 10 MB/s (which is why the cards also carry the V10 badge). However, guaranteed minimum performance figures are not the only requirements of the A2. All cards carrying the A2 label are mandated to support such functions as command queuing (with a minimum depth que of 2 and a maximum depth que of 32) to optimize random read performance, caching to hit write performance targets, as well as 'self-maintenance' features and low-voltage signaling (LVS). To support all the additional A2 functionality, the new SD cards need appropriate controllers and support from hosts. As you can likely guess, ADATA does not disclose supplier of its controllers, but the fact that the company is showing the card indicates that at least some suppliers are already sampling appropriate ICs. For example, Silicon Motion is sampling its SD 6.0-compliant SM2705EN and SM2707EN controllers that support command queuing, caching, self-maintenance and low-voltage signaling (LVS). The aforementioned controllers are compatible with 3D MLC/3D TLC memory and feature Silicon Motion's DuoECC engine with improved data correct ability (given the application, it is logical to assume that we are dealing with a BCH-based ECC, but we have not confirmed that). Besides controllers, A2-compliant SD cards have to be supported by hosts and this is concern for hardware makers (including ADATA and SMI). In particular, command queuing and caching features have to be supported by hosts and currently there are no hosts that support CQ and caching for SD cards. ADATA is currently planning to release the Premier microSDHC/SDXC UHS-I CL10 V10 A2 LV cards either late in 2017 or in early 2018, depending on various factors, including support by hosts. Pricing is something that the company will determine closer to the launch.